Two spacious, bright rooms with queen beds and their own private decks. The rooms are joined by Jack and Jill bathroom. These bedrooms are on the top floor of the owner's residence. Guests have their own private entrance. Located across the street from the ocean. Within walking distance from deli, ice cream, shopping and beauty salon. Enjoy both the beautiful sunsets and sunrises like no other from your own private decks. Large secluded yard for your children, pet/s (always welcome), outdoor games and barbecuing on our new grill overlooking the pond. Hatteras Village enjoys a little bit of everything for the beach lover: numerous wonderful restaurants, boutiques, lots of water sports as well as head boat and charter fishing, all within one and a half miles from the studio. Happy Belly Ice Cream and Kats Deli are a few yards away. A Hatteras native, we know all about our beautiful island and its lore. The pet fee is for 1 dog please message me if you have questions about a 2nd pet. I work near the house and live downstairs. I am available to answer any questions or concerns at any time by phone. I am a tenth generation Hatteras Island native. I am a business owner and artisan, making hand blown lampwork beads. The island is a part of what I am, the salt, the sand, the sea. The property has a deck off each bedroom that you can view the ocean and the sound and It is across the road from the ocean. The bedrooms are very large with microwave, refrigerator and coffee pot. You can watch the sunrises and sunsets. The Jand Jill bathroom is shared with both bedrooms. 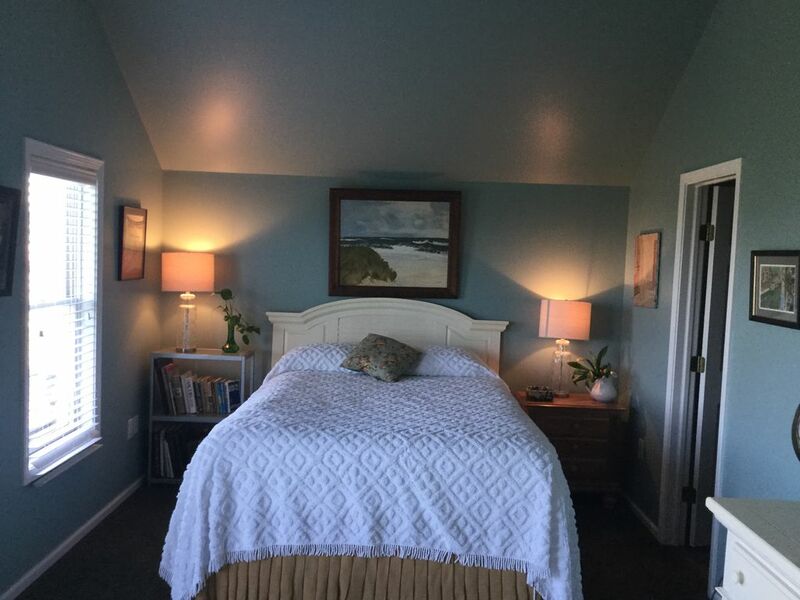 We have views of the Atlantic Ocean and Pamlico Sound. The thermostat is located on the outside of the master bedrooms door. Linens and towels are included in the rental feel. No extra charges. And I'm happy to wash towels during your stay for longer visits. Very nice refrigerator with freezer. We have disposable plates, cups, knives and forks. Southside does not have a kitchen. We have a refrigerator, microwave, toaster oven and coffee pot. Very large yard for pets, children or outdoor games. View of Sound and Ocean from both private decks. We also have deck furniture. Wendy's place was a wonderful place to stay for our quick trip down to Hatteras. Very easy to work with and a clean and comfortable apartment. Would stay again. Nice and Clean Place, We enjoyed our Stay, very warm and comfortable house. This place was comfortable and just what we needed for our trip. You can walk to the beach and is a short drive from coffee shops and restaurants. It has pretty views. Owner is friendly and helpful and we would recommend this property. My labs and I had a wonderful time in Hatteras! Wendy’s place was great with just a short walk across the street to the beach-the weather ended up being perfect! The accommodations were great- there are two bedrooms with a shared bath-there is a private entrance and a balcony off each bedroom. The neighbors have chickens which really entertained my labs. We left the day before the mandatory evacuations in Hatteras due to Florence-but it was the day we planned to leave anyway-we had a great time!! Wendy's place had everything we needed for our stay in Hatteras. Even though the weather did not always cooperate, we enjoyed our stay with Wendy. Would recommend. Wendy was a great host. Her space is awesome for a family! The place is beautiful and the bedrooms are very spacious. It has a shared bathroom that is bright and warm. There is no kitchen, but we planned ahead and brought stuff for sandwiches and snacks. There is a bigger than normal mini fridge with a freezer that keeps your things cool. We brought a cooler up for extras. She provides linens and towels and pillows, and even brought up her air mattress for us to use. We had our own, but hers is the fancy kind you plug in and it inflates in no time. The beach is across the street and across a parking lot. Beautiful beach and not crowded at all, and our visit was in mid July! I highly recommend visiting Hatteras light house beach as well, which is about 10 miles away. Lots of neat shells and kind of a gem spot, as there were hardly any other people there. Wendy provided some plasticware and paper plates and such. There is a coffee maker, filters, and she even has coffee for you to use if you wish. Perfect spot for our little getaway with 3 kids. There is room for 6 total if you bring air mattresses. The two beds were very comfortable, and the decks off both bedrooms provided beautiful views! Will definitely stay again!